Very spacious villa with generous rooms and large bathrooms. The pool was a good size and lovely and warm. The restaurant has lovely views and fine dining service and food. Children’s menu was great. Karma Kandara Resort is located on Ungasan Hill; there is a beautiful outdoor infinity pool overlooking the Indian Ocean. 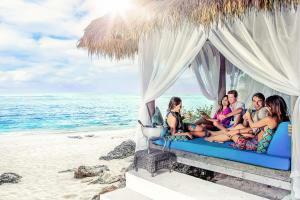 As guests of the villa, we had free access to Karma Beach Bali with free reservation of daybeds. Our villa was huge (with 3 bedrooms and 4 bathrooms), clean, with all the fornitures needed and with a nice private pool. My highlight is the concierge support - thank you Ari and Dewi. The two ladies are very knowledgeable. Excellent support by all staff. Overall, service and facilities were good and with a few improvements the resort can really be worth its price. Unbelievable views and tranquility of the resort. Impressed by the golf buggies that get you around. This place is perfect if you want to hang out (great for families) in the resort and just use the private beach with activities or relax in your villa... You need a scooter (or some form of transport) if you want to go out and about. It is very isolated, so if you're an out and about sort of traveller then look elsewhere. Can appreciate the beauty and reason why people love this place, but as an active get out and go traveller, it wasn't the place for me. Karma Kandara is an excellent resort. Our villa was perfect. I loved the design, the decoration and the furniture. It was very clean and comfortable. The view from our balcony was great. The staff was very polite and helpful. The food was fantastic but a little pricey. Karma Beach was also very beautiful and well-organized. We really had a great time. It was one of our best stays in our trip in Bali. Amazing beach and beautiful resort. Pure luxury. Day spa had some of the best views. It is expensive to stay here but worth it for the experience. Would come back again. Lock in a great price for Karma Kandara - rated 8.4 by recent guests. Situated on Ungasan Hill overlooking the Indian Ocean, Karma Kandara Resort offers villas with a private pool. Providing free WiFi throughout the premises, it boasts an exclusive beach club and a fitness centre. 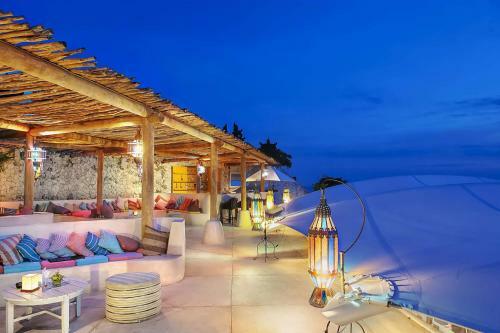 The spacious villas offer views of the sea and are fully furnished with a dining area, living room and kitchen. Amenities at each villa include air conditioning, a flat-screen cable TV and a safety deposit box. For extra comfort, the bathroom is stocked with a hairdryer and free toiletries. Karma Kandara Resort features an outdoor infinity pool and massage treatments at Karma Spa. The near-by Karma Beach Bali has daybeds, a bar and water sports activities. Airport transfer can be arranged at an additional charge. Grilled Mediterranean delights, Asian dishes and Western flavours are served at the resort’s 2 on-site restaurants. Cocktails are available at the rooftop bar and a 24-hour room service is provided. Karma Kandara Resort is approximately 6.8 miles from Ngurah Rai International Airport. This property also has one of the best-rated locations in Uluwatu! Guests are happier about it compared to other properties in the area. Karma Kandara has been welcoming Booking.com guests since 25 Aug 2009. When would you like to stay at Karma Kandara? Two-bedroom villa features private pool, flat-screen TV and DVD player. The villa offers open-plan indoor and outdoor living and dining space, a fully equipped kitchen and an en suite in the master bedroom. Three-bedroom villa features private pool, flat-screen TV and DVD player. The villa offers open-plan indoor and outdoor living and dining space, a fully equipped kitchen and an en suite in the master bedroom. Four-bedroom villa features private pool, flat-screen TV and DVD player. The villa offers open-plan indoor and outdoor living and dining space, a fully equipped kitchen and an en suite in the master bedroom. This spacious villa has a private pool, full kitchen facilities and a living room. The villa offers open-plan indoor and outdoor living and dining space and an en suite in the master bedroom. This spacious villa boasts an outdoor swimming pool and a sumptuous living area that comes with a flat-screen satellite TV and DVD home theatre system. It has a dining area and a fully equipped designer kitchen as well as a well-stocked minibar. Each bedroom is air-conditioned and fitted with a wardrobe, personal safe, and an en suite bathroom which has an outdoor shower facility, free toiletries, bathrobes, and hairdryer. Guests can enjoy a relaxing afternoon sunbathing at the terrace by the pool. Private in-villa dining and private chef service are available upon requests and at additional chargers. This spacious villa boasts an outdoor infinity pool overlooking a clifftop with undisturbed views of the ocean. This villa also comes with a sumptuous living area featuring a flat-screen satellite TV and DVD home theatre system, a dining area and a fully equipped designer kitchen as well as a well-stocked minibar. Each bedroom is air-conditioned and fitted with a wardrobe, personal safe, and an en suite bathroom which has an outdoor shower facility, free toiletries, bathrobes, and hairdryer. This five-bedroom villa boasts a private outdoor infinity pool on top of a cliff and overlooking the sparkling azure waters. It also has a dedicated cinema room, wine cellar, a large living area, dining area, and fully equipped designer kitchen. Each bedroom is air-conditioned and fitted with seating area, wardrobe, personal safe and an en suite bathroom which has shower and bath facilities as well as free toiletries, hairdryer, and bathrobes. Guests can also enjoy a range of private facilities like, hot tub, sauna, and spa. Private butler service is available upon request. This five-bedroom villa boasts a private outdoor pool on top of a cliff and overlooking the sparkling azure waters. It also has a dedicated cinema room, wine cellar, a large living area, dining area, and fully equipped designer kitchen. Each bedroom is air-conditioned and fitted with seating area, wardrobe, personal safe and an en suite bathroom which has shower and bath facilities as well as free toiletries, hairdryer, and bathrobes. Please note that guests booking the 8-person rate will have access to 4 bedrooms and the other room will be locked. This villa has a private pool, full kitchen facilities and a living room. The villa offers open-plan indoor and outdoor living and dining space and an en suite in the master bedroom. 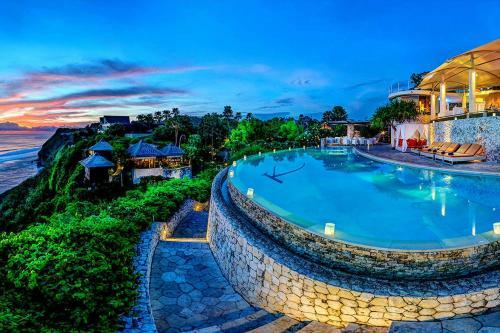 Karma Kandara is very beautiful property, located on cliff in south of Bali, Karma Kandara offering a property with amazing ocean views, we have a restaurant, spa, infinity pool, and villas with ocean view. Karma Kandara also have a beach club. Karma Kandara is in close proximity to a host of a world class beaches. The famed boutiques and restaurants of Jimbaran, Kuta, Legian, and Seminyak area are also just a short drive away. House rules Karma Kandara takes special requests - add in the next step! Karma Kandara accepts these cards and reserves the right to temporarily hold an amount prior to arrival. Please note that guest needs to fill credit card authorization form in order to secure the booking and avoid fake/stolen credit card issue. Failure to comply may result in cancellation. 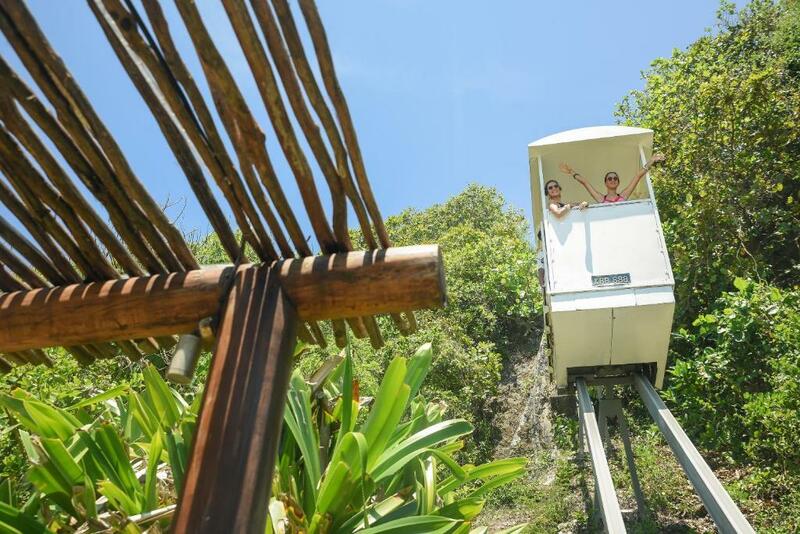 Please note that the hill tram connecting the property to the beach club is undergoing maintenance works until further notice. Please inform Karma Kandara in advance of your expected arrival time. You can use the Special Requests box when booking, or contact the property directly with the contact details provided in your confirmation. The cable car to the beach was not in service and there were hundreds of steps down and back. The food options were limited and would be repetitive if eating there daily for more than a few days. Service was good and friendly but no always efficient. A broken air conditioner took days to fix. - The cable car to Karma Beach is under maintenance upto 1 more month, but I couldn't get any prior information regarding this issue. Even the check in time, that information wasn't delivered to me properly. - If someone want to enjoy the private Karma Beach, must check before booking. - Shuttle to Beach is not comfortable and easy to access there on time. The hotel beach bar is quite expensive but there is a cheaper local beach bar down the beach which is excellent! Loved Karma Kandara! The views from the restaurant and pool are stunning - most beautiful views on our whole Bali trip. There is a tram to take you down to the beach, which is very helpful since it's so far down. Concierge was not thinking when proposing tours. My wife spend 7h in the car for one dive. The other day cycling tour+ cooking class. 2h drive to do cycling tour, then they have planned another 1,5h to do the cooking class. But not 1,5h in direction of the hotel, the plan was going more far away. We could change the cooking class to a close spot in the end. Thanks to the driver. Very nice beach, not many people. The noise coming from above my room. My bed linen was blood stained but I was happy that it was changed upon request. Breakfast very, very limited, no buffet and only one a la carte item to choose from. Monkeys (although beyond control of resort), they are vicious and get into your villas. No opening up the doors relaxing and enjoying the views whilst they are around! Twin beds in the ocean view Villa No.3 weren't very comfortable. Have to plan ahead and allow time for golf buggies to get you around the resort and to the entry. Peak periods you can be waiting a bit, the alternative is to walk, but if you have bags it is very hilly and depending on your villa can be a decent exercise. The restrictions @ breakfast. The menu is very selective and you cant add (or even swap) things without having to paying extra. The views and atmosphere around the restaurant are amazing though!